At last year’s customer summit in San Francisco, we heard from various customers, industry leaders, and Fastly engineers on themes like the future of the edge, solving (almost) anything in VCL, and the key to successfully growing teams. The Chrome team decided to try out service workers, which enable reliable performance by storing content in a new cache API. 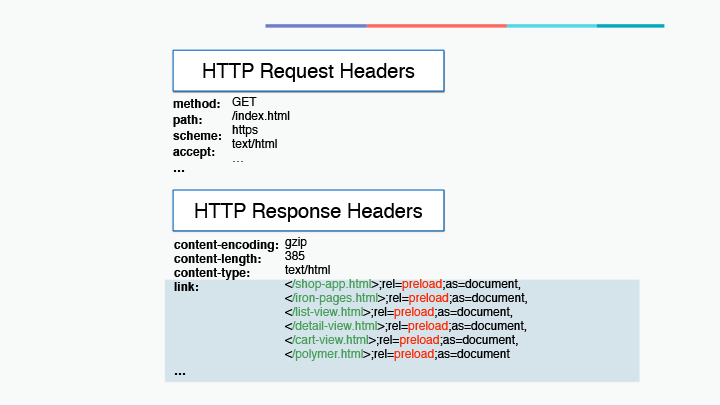 According to Google’s web team, “A service worker is a script that your browser runs in the background, separate from a web page, opening the door to features that don't need a web page or user interaction.” They give web developers the ability to respond to network requests made by their web applications, allowing them to continue working even while offline, giving developers complete control over the experience. Currently, a service worker can only intercept requests to third parties if they’re permitted by the cross-origin policy for that host. Therefore, the only way a third party can leverage the benefits of service workers is to integrate with those from the root domain. And even then, visibility into requests for that third party are limited due to cross-origin policies. 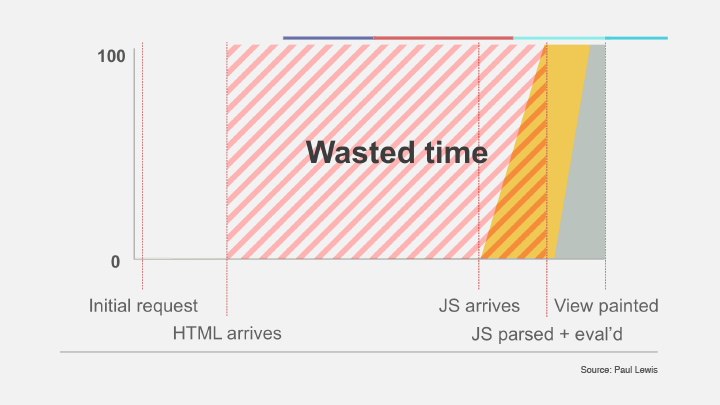 To address this, the Chrome team is working on foreign fetch service workers, which empower third parties to handle these requests with their own service worker, allowing for full visibility and optimization across sites that use the same third-party service. 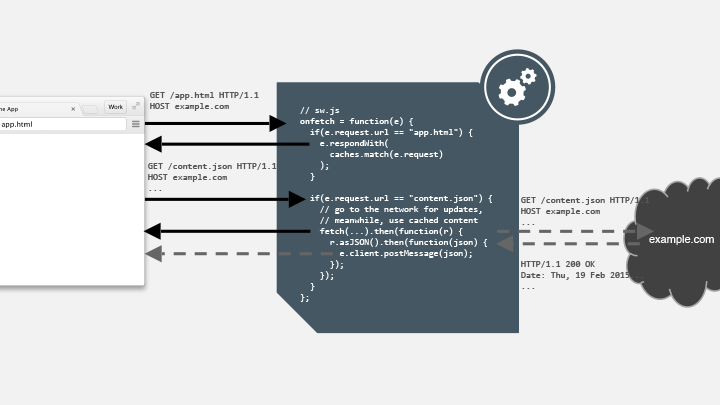 With foreign fetch, a service worker can opt in to intercepting requests from anywhere to resources within its scope, preventing requests from hitting the network that would do so otherwise — for example, recognizing a request for a font from a CDN and routing it to a shared, client-side cache that other origins are using. Now, third parties like font CDNs, analytics services, and ad networks can all implement their own service workers, leveraging their full power without having to do deep integration with those deployed by first parties. In addition to reliable performance, you need a way to reach your users, and it’s far easier to get them into experiences with a link than with an app store pointer. 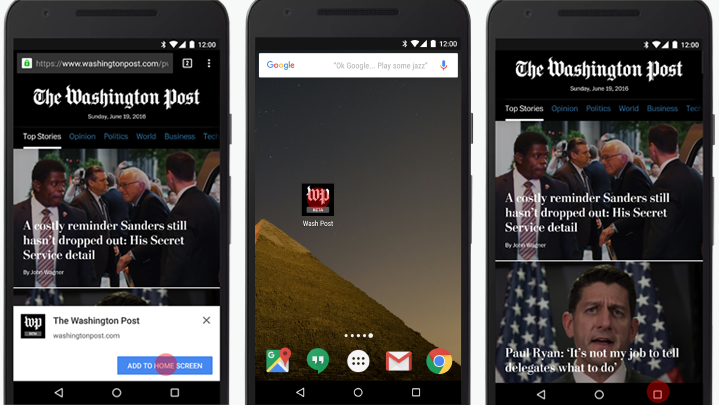 Alex used the example of The Washington Post’s progressive web app (PWA): from wapo.com, mobile users can add The Washington Post to their home screens, making it easy to get to without having to download anything from the app store. 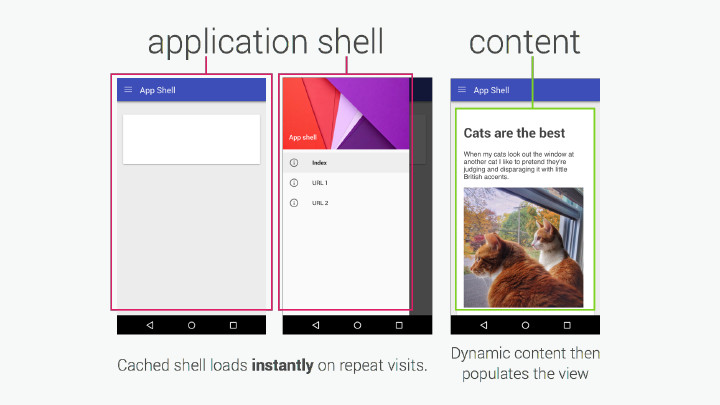 PWAs allow you to provide an engaging experience for your users without having to build something multiple times. If you’re interested in building your own PWA, you can check out The Washington Post’s metadata here: washingtonpost.com/pwa/manifest.json and Chrome’s Lighthouse tools help you verify you’ve created an app-like experience for your PWA. 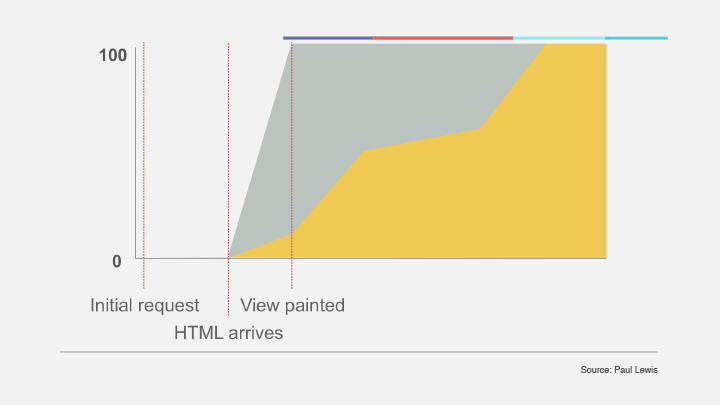 What we really want is the ability to use “all the bits onscreen” as the site arrives and paints. 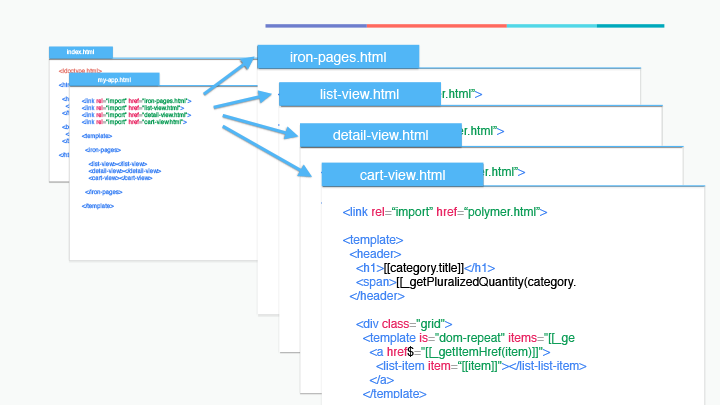 To demonstrate the ideal page load, Alex showed us shop.polymer-project.org — as expected, the page loaded quickly, but everything that showed up was also interactive. Although there’s a lot of script time total, most of it is “chunked,” so the site stays responsive. The chunks arrive as the user needs them, creating a smooth user experience and eliminating the Uncanny Valley. For example, the components shown above can start to be sent as soon as you grab the initial response, without smushing them into a single, overlapped file, making invalidation a lot easier. 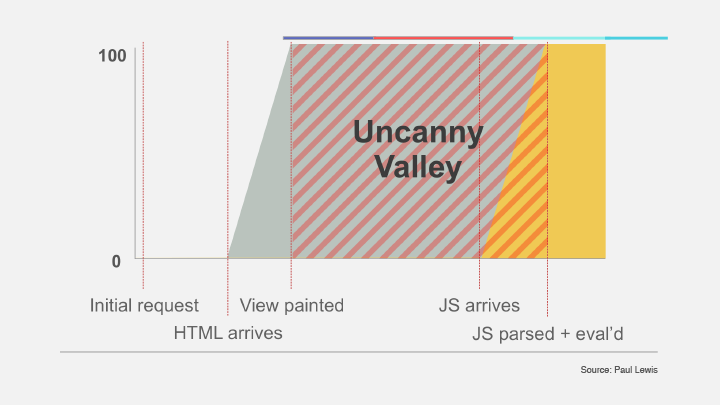 You can lazy load and create a secondary route with selective upgrade — a clever trick the Polymer team came up with to make components appear only when you really need them. When the user decides to go to another section, that thing that was already in your document suddenly gets instantiated because they switched the view. Watch the video of Alex’s talk below, and stay tuned — we’ll continue to recap talks from Altitude 2016 and beyond. 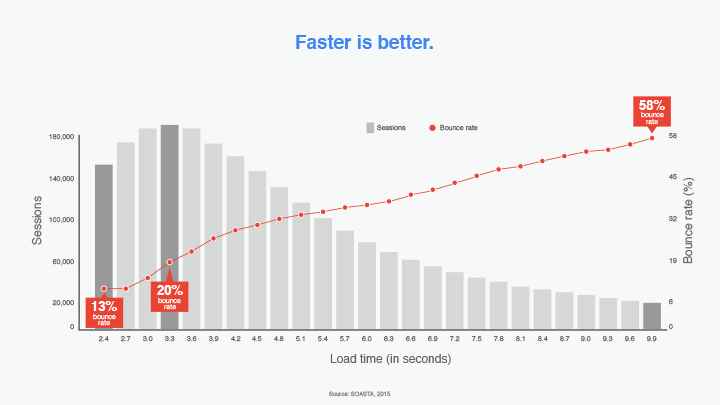 Anna MacLachlan is Fastly’s Content Marketing Manager, where she talks to brands and partners to tell stories about scale, security, and performance. She received her MA in Comparative Literature from NYU and loves megafauna and mountains.